1. 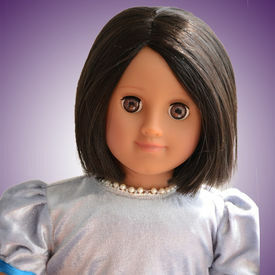 A beautiful collectible 18" doll with modern Taara dress. The silver and blue dress is made of velvet and satin with beatiful pearls on the neckline. Taara's Doll Package (Festive Silver) contains the following: 1. A beautiful collectible 18" doll with modern Taara dress. The silver and blue dress is made of velvet and satin with beatiful pearls on the neckline. 2. A colourful fully illustrated book with a story of Taara's curiosity and love for science and math.